You don’t have to go to Broadway to see award-winning theater! In Arizona, there’s an abundance of world-class venues to take in plays, musical theater performances and more. Theaters across the state put on productions that please every variety of fan. From new revivals, to classics, and even some hilarious parodies, you’ll find it all. Consider one of these stellar local theaters next time you want to catch a live show! ASU Gammage is a world-class theater and one of the largest university-based performing arts centers in the world. Though it’s part of Arizona State University, Gammage derives most of its funding from its Broadway series. Speaking of Broadway, Gammage is the best place to see Broadway hits in the state of Arizona. You can see big name shows like “An American in Paris,” “The Book of Mormon,” and “Hamilton” in their auditorium. Gammage is housed in a 3,000-seat theater designed by the acclaimed Frank Lloyd Wright. The auditorium is a fantastic setting to take in their award-winning shows. Mesa is home to the largest performing arts center in Arizona. The Mesa Arts Center is a massive 210,000-square-foot facility that includes four performance theaters, five art galleries, and 14 art studios. Owned and operated by the City of Mesa, this award-winning venue has a strong lineup of performers every year. You can see performances by East Valley Children’s Theatre, Southwest Shakespeare Company, and Mesa Encore Theatre at their state-of-the-art facility. Looking for dinner and a show? Look no further than Arizona Broadway Theatre. This dinner theater provides outstanding dining and service to go with their live theatrical productions. The main stage performance space includes room for 470 theatergoers to take in their musical productions. In addition to the venue, Arizona Broadway Theatre has top-level talent. They handpick their performers through a series of auditions held both locally and afar. Gaslight Theatre has been dishing out the laughs for over 35 years. This western-themed theater hosts family-friendly entertainment and comedic spoofs of Hollywood blockbusters. Their quintessential hits have included spoofs like “Henry Porter,” “Wizard of the Rings,” and “Spider Guy.” Gaslight performs five shows, six nights per week every year. Plus, you can snack on your favorite treat from the concession stand while taking in a show. The Herberger Theater Center is a performing arts center and arts advocate for the Phoenix community. In addition to hosting live theater, this non-profit supports the growth of performing arts through youth outreach programs. Herberger’s resident companies include the Arizona Theatre Company, Center Dance Ensemble, and iTheatre Collaborative. You can take in some of their diverse performances at the 800-seat Center Stage in downtown Phoenix. Step into the past at Orpheum Theater. This 1,364-seat theater is also on the National Register of Historic Places. Orpheum originally opened in 1929 and was reopened after a multimillion-dollar renovation in 1997. Today, it remains a favorite among local theatergoers. The downtown Phoenix theater hosts a variety of off-Broadway performances including “A Chorus Line” and “Jersey Boys.” History buffs can also take a free public tour of the theater led by a team of docents. The Temple of Music and Art is located in a 1920s theater in historic downtown Tucson. There’s not a bad seat in the house at this cozy 627-seat theater. However, this venue is all about the performers. The Temple of Music and Art is one of two venues that host the Arizona Theatre Company. Over the last four decades, this non-profit theatre troupe has produced over 200 plays. You’re bound to see a world-class show at this Tucson venue. Symphony Hall is multi-purpose performing arts venue located in downtown Phoenix. The venue is lined with over 2,300 seats with wood bases for enhanced acoustics. Since opening in 1972, it has been home to the Phoenix Symphony—Arizona’s only professional symphony orchestra. It’s also home to live theater, musicals, and Broadway celebrations throughout the year. This comfortable theater also has a great location. It’s adjacent to the Phoenix Convention Center and many downtown restaurants. The Hale family knows live theater. That’s because they are the longest running privately owned theater company in the country. They have five theaters across three states and opened their Arizona location in 2003. Since then, Hale Centre Theatre has become a go to for family-friendly plays and musicals. Their 350-seat venue is located in Gilbert’s Downtown Heritage District. They’ve also partnered with several local restaurants where season-ticket holders can get discounts. 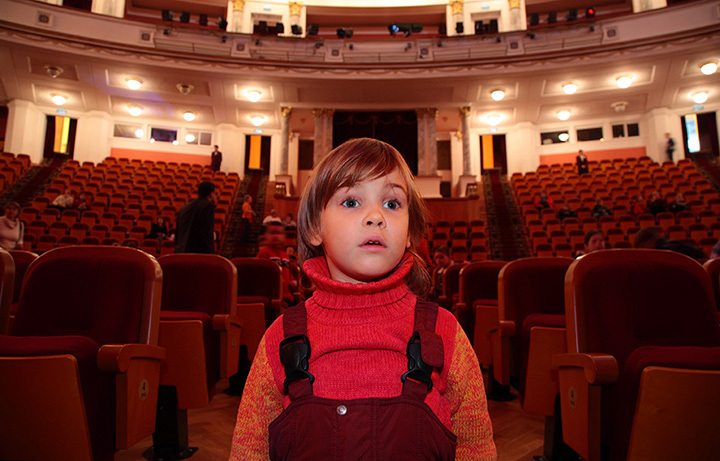 This fun, family-run theater produces around 10 entertaining shows per year. Founded in 1920, the Phoenix Theatre is one of the oldest continually operating theaters in the western United States. In 1951, Phoenix Theatre opened its current location in central Phoenix. This modern performing arts venue consistently puts on excellent productions. You can see Broadway-style shows in an intimate setting at the main stage. This non-profit theater remains one of Arizona’s most impressive venues to see live productions. View more Arizona Theaters and Playhouses.